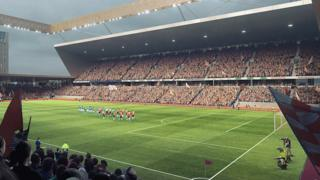 A consultation roadshow has begun over plans for a new 17,500-seater stadium for Luton Town. The club identified the Power Court site, near the town's railway station, as the ideal location in December. The Hatters want to move into the new ground by 2020 and are due to submit a planning application in the summer. More than 1,000 people went to see the plans on display at the club's Kenilworth Road ground on Saturday. The exhibition is now open as part of a week-long public consultation. It will move next to Venue Central in Leagrave Road and then The Hat Factory in Bute Street. Luton have been at their current stadium, Kenilworth Road, since 1905. The Hatters hope to develop land they own near junction 10 of the M1 with retail, leisure and office facilities to help fund the Power Court move.